So, what do I do when the hubs is away on biz trip? 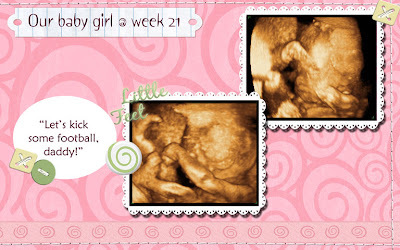 I decided to try my hands on some digital scrapbooking. Thanks to Dinah (i read her blog occasionally and her scrapbooking has really amazed me!) who pointed me to the right direction! My first attempt at digital scrapbooking for our baby :) It's all pink although I try to stay away from the pink = girl theme.. but i just can't help it. They look too cute! To tone down the pink effect - I added some yellow & green buttons all around. I spent the whole afternoon downloading templates, kits, embellishments to do this. And of course, trying to figure out how to use Photoshop again (after 1 year of not using it). I must admit I quite enjoy it :) Will see what else I will do tomorrow. And yes, I have another project to learn up in the next 3 months. Maybe I'll look into it tomorrow. That one looks abit tough. It reminds me of the time when I was trying to learn Flash (CG had patiently try to teach me but it's just too difficult!). The whole afternoon gone and now it's time to cook dinner... for myself. 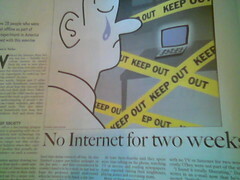 Was made internetless for the last 4 days. Life was indeed tough without access to the internet. Initially, I suspected our internet provider was at fault. Called their number numerous times, and no one picked up the phone, their message on their helpline says "Pls remember that all queries can be handled by our technical assistants on our website." I sniggered at the statement. A Twitter-er? Why, of course! Don’t know about you, but the past 2 days has been agonizing : internet connection-wise. Connecting into the latest obsession of mine – Twitter – has proved to be a real tortoise-slow torture! Just what is Twitter? Introduced to me by good friend Praveen (internet guru), he offered his opinion on this service launched officially in the US half a year ago but the idea actually took life about a year ago (13 Mar),“It’s a great tool to update your daily happenings and have it broadcast to your circle of friends”, to which I quipped, “But we have blogs to do that!” Almost rolling my eyes. “Yes. But Tsu Lin, wouldn’t it be nice to know (while you’re on the go) what your friends are also doing with live updates to your mobile (or your chosen mode of device)? ie Praveen is diving off the Great Barrier Reef”. Hmmm.. to convince me, I decided to put it to test. 7,000 miles and 1 week later, I find myself registering into Twitter’s mobile phone notification service. As this service is based in the UK, I’m only charged a local rate when I send my twitter updates onto the site. Pretty nifty! Praveen has his registered back in KL and he’s being charged the standard international charge. No other hidden costs of using this service, which is an ultimate PLUS! Even the name is pretty original. Met up with the SIL, Alicia for yumcha on Saturday. For reasons i still do not comprehend, these Aussies (hubs included in this case) like to call their dim sums "yumcha". To us M'sians, as the phrase suggests, "yumcha" should only mean "Drink Tea/beverages", and it should not matter if it's teatime, brunch, breakfast, or supper. :P Anyway on Sat, we popped over to our favourite nearbyrestaurant. Dim Sum was good, we wanted to order the suckling pig but today, they ran out of it. 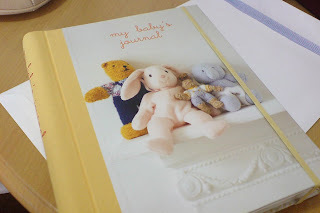 The SIL brought a little gift for the baby - a Baby Journal. Very sweet! Now.. if only I can bring myself to scribble on its pristine pages. The rest of the day was spent around this area... and even a visit to the local chinese grocery place where we stocked up on essentials. A busy day. We started the day early as we wanted to go to the Baby Show at ExCeL London before lunchtime. Had our brunch and was out by 11am. We quickly found a parking after paying £6 for 2 hours of parking and made our way in. 1. Maclaren Techno XLR Travel System - Stroller, car seat, foot muffs, rain cover. 3. Tommy Tippee nappy wrapper - The sales pitch : "At the end of it, u just twist this thing, lift it up and throw this sausage looking thingy away!". Haha, nappy wrapped sausages, indeed! Of course, there are samples galore. During halftime, we went out to grab something to eat & drink and made our way back in. I'm now recuperating from the 2 days adventure. :P Can't wait for next weekend. is also ironically MAS's shopping magazine. Anyway, the day before I were to leave to London, Soo Yin invited us over to her place for a small gathering. The usual suspects were thr : WS & M, me, ES & Jac. It's there that I was introduced to the device that is DS Lite. They all had one each : WS & ES with their black or dark blue ones, SY with her very delicious PINK one! Apparently CKP has a white one. I'm so tempted to get the light blue one so we all in the group have all the colours. We networked up the 3 DS's and played a few rounds of that-game-which-name-I-forgot. Should I, should I not? The hubby reckons not... but yesterday he showed me the cool Bose headphones (noise cancellation) (I think it's this model) tht he probably acquired during his trips to the US! He refused to tell me how much.. 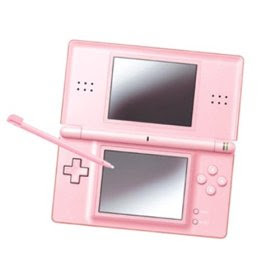 Anyway, the DS Lite sells for £99 at Amazon (with free delivery). Definitely worth thinking about - I want the game we played tht Saturday. (There's a guy on the same flight as me who brought out his white DS Lite.) Truly a good companion on flights. London : the flight went smoothly and i didn't get to sleep much in their almost-flatbed bed. I probably slept for 2 hours. I did manage to watch some shows though - Happy Feet (fell asleep halfway, oops! ), Stranger Than Fiction (didn't finish watching it despite Praveen's rave review) and Deja Vu. I quite enjoy Deja Vu - The concept of time travel in the show isn't very convincing nor belieavable to me BUT despite tht, (and let's assume tht I bought into the concept).. the movie's storyline and acting are very enjoyable. I also watched a little of "The Banquet" at the last 20mins of flight. I found myself fast-forwarding every now & then. Don't think I'll quite like it.